Tender pork chops in a creamy Dijon sauce are ready in minutes using the Instant Pot pressure cooker. 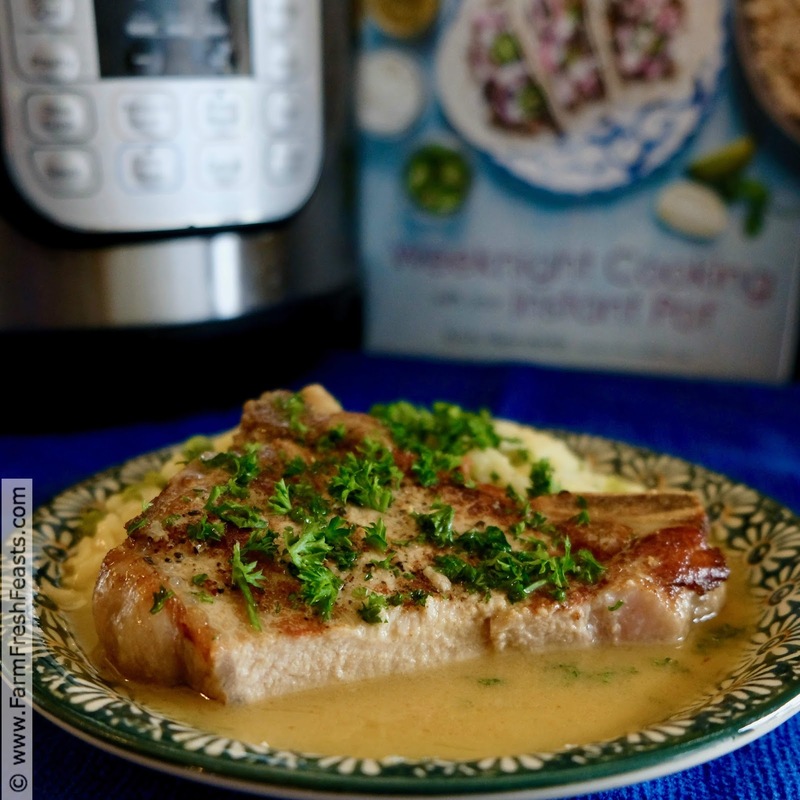 Four simple ingredients for the sauce, six minutes cook time under pressure, and an easy weeknight dinner is done! This post is sponsored by the Ohio Pork Board. They asked me to create a post for an easy weeknight dinner so I'm bringing you these tender pork chops in a Dijon pan sauce. 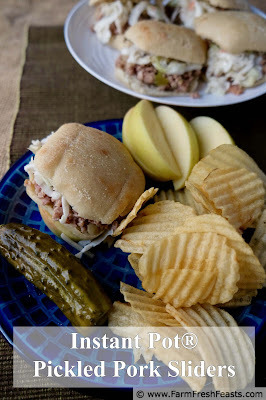 I used the Instant Pot pressure cooker to make them in minutes--this recipe is definitely a weeknight keeper! This recipe comes from the cookbook Weeknight Cooking with your Instant Pot by Kristy Bernardo. 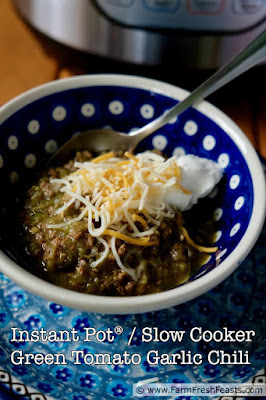 I've enjoyed her Wicked Noodle website for a while now, so when she asked her fellow food bloggers if we wanted to check out her new Instant Pot cookbook my hand shot right up in the air. [Then I put it down and started typing out my info for the publisher.] 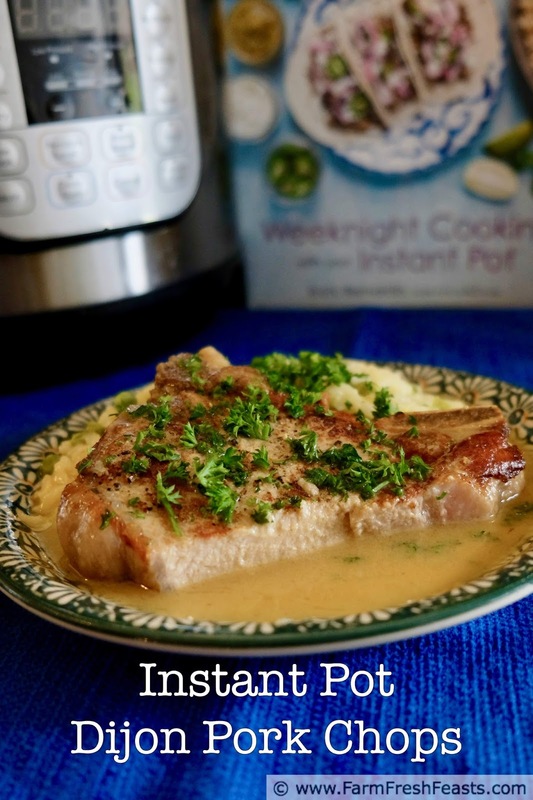 Finding an easy weeknight recipe, using a common cut of pork in an interesting and accessible variation, was total synergy and I knew I'd combine this cookbook with this sponsored post to make a terrific meal. One of my favorite aspects of the Instant Pot, as you can see from my video below, is that I can walk into the kitchen, start the machine heating on the Sauté function, then gather my ingredients while it's getting hot. Like I showed in my Spring Risotto recipe video, you don't need to have your onion chopped before you plug in the Instant Pot. Just get it going and then you can get going! I may not have a relationship with my local butcher, but I do have a relationship with my local hog farmer. To determine the best type of chop for this recipe I headed down to the farmer's market to ask Jean Mattis of KJB Farms her opinion. She suggested an inch thick center cut chop which would hold up well to pressure cooking. 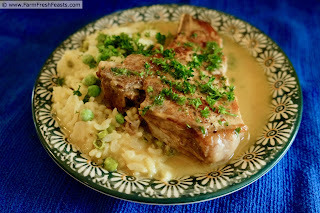 Jean is right--the chops turned out moist, tender, and fully cooked! The first time I made this recipe I substituted whiskey instead of white wine in the sauce. [I'm trying to use up booze before we move, and I'm not much of a whiskey drinker.] The sauce was terrific--anything with a stick of butter will taste good--but I figured I'd try it again with the white wine Kristy calls for and that also resulted in a yummy sauce. We used the rest of the sauce on roasted potatoes, and I think it would also be good with rotisserie chicken. 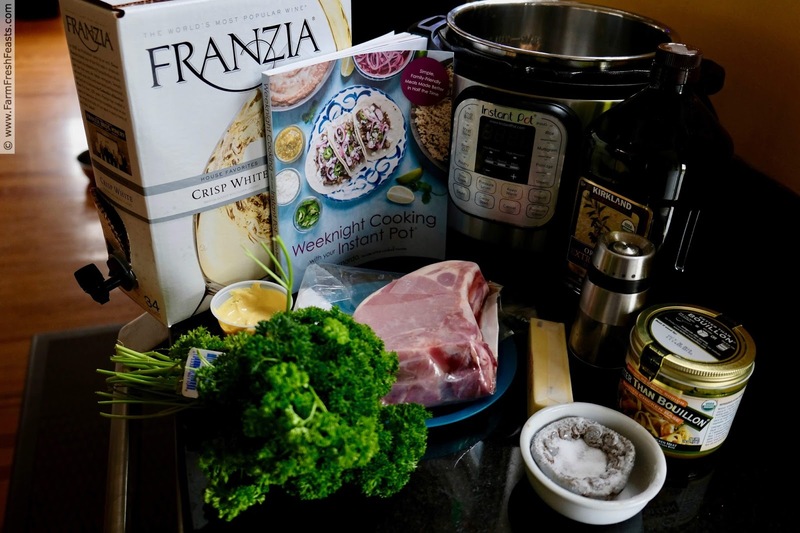 If you don't have white wine or whiskey, try sherry or use additional chicken broth. For a similar technique and different flavor, maybe beer with stoneground mustard instead of the Dijon? Note: my pork chops, in addition to being thick, were very large. This was great for feeding my hungry teenagers, but did mean that the browning took longer as I could only fit 1 chop at a time in my 6 qt pot. I was OK with that--I don't need a larger machine--but know that if you've got smaller chops or an 8 qt pot, you can brown the chops twice as fast by doing 2 at a time. Based on my raw footage, it took me about 17 minutes from turning on the Instant Pot to closing the lid to start pressure cooking. Press Sauté to preheat your Instant Pot. Season the chops with salt and pepper on both sides. When the word "Hot" appears on the display, add olive oil and brown the chops on both sides, about 3-4 minutes/side. Remove chops and set aside. Add wine and stir to deglaze the pot, allowing the wine to reduce slightly. Add the chicken broth to the pot then return the chops to the pot, along with any accumulated juices. Close and lock the lid of the Instant Pot. Press "Manual" and adjust the timer to 6 minutes. Check that the cooking pressure is on "high" and that the release valve is set to "Sealing". When the time is up, allow the pot to release pressure naturally for 10 minutes, then release any remaining pressure using "Quick Pressure Release". Remove the chops and tent with foil to keep warm. Press "Sauté" and allow the sauce to reduce by half, about 5 to 7 minutes. Stir in the Dijon. Add the butter two pieces at a time, stirring until incorporated. Taste the sauce and season with salt and pepper, if necessary. 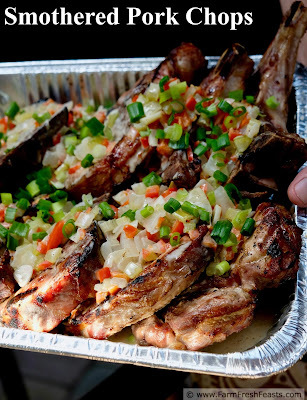 Return the chops to the pot and toss them gently to coat with the sauce. Top with the parsley and serve. We had these with Instant Pot Spring Risotto. 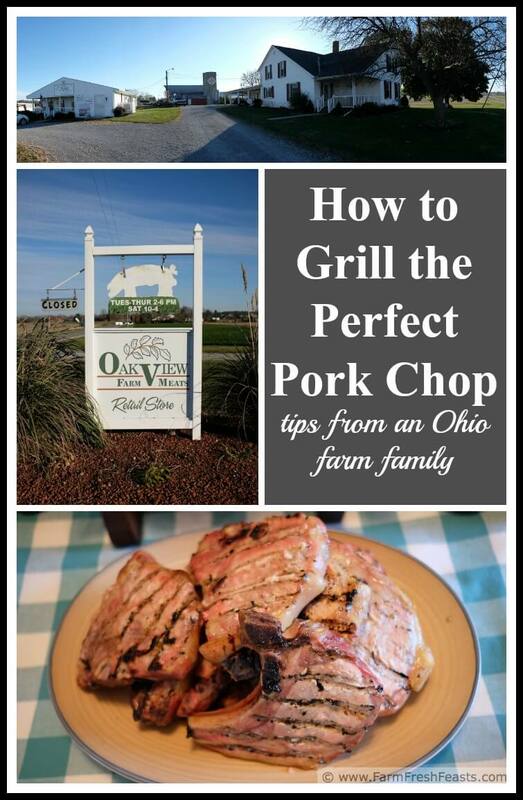 For other pork chop recipes, may I tempt you with How to Grill the Perfect Pork Chop (recipe from the Runyan family of Oakview Farm Meats) or Smothered Pork Chops by Chef Matt of Colonel De's Spices? For more meaty recipes using the Instant Pot, how about Pickled Pork Sliders or Green Tomato Garlic Chili?